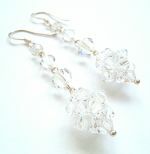 Our gorgeous Annette sparkly crystal drop wedding earrings dangle beautifully with a Swarovski crystal cluster centre piece made using sparkly 4mm AB crystals. 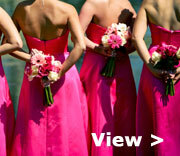 Our Swarovski crystals are dazzling and sparkle much more than our images can illustrate. 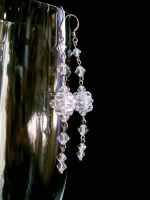 Anettes's drop measures approx 2 inches and dangles from sterling 925 silver hooks. We can change the hooks for sterling silver posts and butterfly backs if you prefer, you can select this option when placing your order. 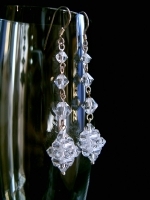 Like this earrings jewellery item but need it in a different colour? 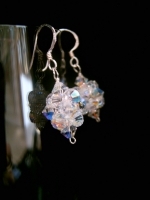 No problem, we can make these bridal earrings in over 50 alternative Swarovski crystal colours to match your attire. 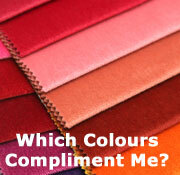 Use our Swarovski Crystal Colour Chart to find the colour that's perfect for you and then select that colour in the dropdown menu when placing your order. The crystal colour used in the main image is AB and below you will find anothre in clear crystal 001, our model is also wearing them in clear crystal 001.